Is there a better alternative to Advanced Mac Mailer? Is Advanced Mac Mailer really the best app in Email category? Will Advanced Mac Mailer work good on macOS 10.13.4? Why Advanced Mac Mailer? Well, effective communications are essential for business success. It is very beneficial to keep your business contacts promptly notified of such things as new products they might be interested in, complimenting offers or other updates. Email as a communication medium presents the most lucrative opportunities. Of course, if you have hundreds or thousands of clients, it is impossible to write a personal message to every one. You must also maintain a list of subscribers changing, adding and removing them as necessary. This becomes very hard even when you consider a list of a few thousand people. Version 4.191: Release notes were unavailable when this listing was updated. Advanced Mac Mailer needs a rating. Be the first to rate this app and get the discussion started! Why Advanced Mac Mailer? Well, effective communications are essential for business success. It is very beneficial to keep your business contacts promptly notified of such things as new products they might be interested in, complimenting offers or other updates. Email as a communication medium presents the most lucrative opportunities. Of course, if you have hundreds or thousands of clients, it is impossible to write a personal message to every one. You must also maintain a list of subscribers changing, adding and removing them as necessary. This becomes very hard even when you consider a list of a few thousand people. Advanced Mac Mailer certainly improves things drastically since it allows you to handle multiple lists with unlimited number of subscribers in each list, and any number of recipient fields used together with customer email address for message personalization. If you use a conventional email client to send your messages, it's a hit or miss situation whether or not your emails are actually delivered. The delivery depends on a multitude of factors some of which are within your control and some of which are out of your control. 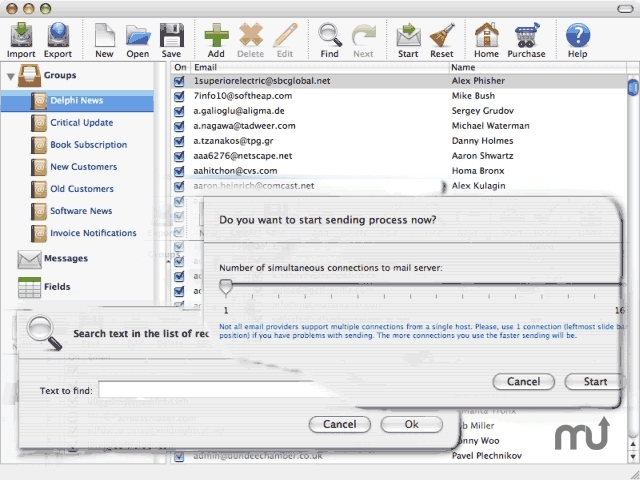 Advanced Mac Mailer takes a burden of removing 90% of most obvious problems of incompatibility and header mismatch by using the standard message delivery framework of Apple Mail. Thus for the outer world, your messages look indistinguishable from those actually sent with Apple Mail manually. Each recipient always receives a separate personalized message that has all the proper headers and fields filled in. All recipient information you save in Advanced Mac Mailer can be exported to a standard plain-text CSV file that is supported by vast majority of other programs. You can also import customer information from all other programs by using a CSV file as a data feed or you can simply choose to extract only email addresses from any file types.